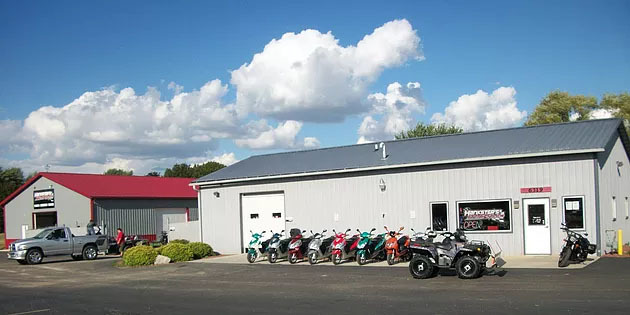 Hankster’s Motorsports started with very humble beginnings out of a one-car garage in Beloit, WI back in 2003. At the time, Hankster’s relied on all of its business from word of mouth and referrals from satisfied customers. Hankster’s is what it is today due to an extremely dedicated and hard-working staff, and they strive hard every day to satisfy each and every customer that steps through their front door. or their “Snow Days & Giveaways Party!” they decided to invite 2,500 of their past customers in for a party and the chance to win a brand new snowmobile. Using a nice mix of active and inactive customers, they knew they could reactivate customers who hadn’t spent money with them in the previous year and increase frequency of visits from their existing customers, to increase the number of folks spending money with them and the amount they spend this year. To ensure everyone received the message, we targeted them with up to 12 direct marketing strategies. By giving customers more opportunities to respond to the marketing, we increased the amount of traffic on event day and the number of leads generated. Bigger picture, we’ve learned that the more you touch your customer base, the more responsive they become and over the course of the year, more of them walk through the dealership’s doors more often and the business grows. The message we utilized was focused on inviting customers to a party. By focusing on what the customer wanted (things like food, drinks, door prizes and demo rides), the dealership got more of what they wanted (more P&A, service and gear sales and a few more units out the door). Long-term, customers never get tired of being invited to a party, so they end up walking through the doors more often and when they’re there, they can’t help themselves but to spend more money. With so much marketing going out the doors, it was important to have it hit customers at just the right time to really maximize the response from each media. Our marketing began hitting customers roughly 10 days before the event and gave them a different opportunity to respond to the survey site (to generate leads for every department) almost every day leading up to event day. Hank said they had a couple hundred people attend the event and ended up giving away 80 hot dogs, 80 burgers and 12 large pizzas! Over the two weeks during and after the event, he said, “We sold a ton of stuff!” They purchased insurance to give customers a chance to win a brand new snowmobile and a lady who had never ridden before won; then she bought $500 worth of gear and her husband came in later and bought a sled and gear as well! There’s a video of her winning the sled on their Facebook page! In addition to the traffic and sales, the Sharp Shooter Program also generated 90 completed surveys, which created a total of 50 sales opportunities in P&A, Service, and riding gear, PLUS 40 responses for a new or used unit turning this weekend event into a month-long sales event for each department following up on the leads, increasing their Return On Investment. We’ll help you start planning your 2018 Marketing Calendar with a FREE Market Analysis. It’s a two-step process 1) We pull a 4-year history of past sales, service & parts customers and show you how many customers you have that are active & inactive 2) compare them to a list of conquest customers (people who ride what you sell and live in your backyard but have never bought from you). From here, we implement a 12-month plan to predictably grow your business. For more information on how the Sharp Shooter Program can help 2018 your best year yet, give me a ring on my direct line at 877-242-4472 ext: 112 or chat us up at www.PowersportsMarketing.com.